Since 2001, Canadians seeking to use cannabis for medical treatment have had access to it under the Marihuana Medical Access Regulations (MMAR). They enabled “individuals with the authorization of a health-care practitioner to access dried marijuana for medical purposes by producing their own marijuana plants, designating someone to produce for them or purchasing Health Canada supply”. The procedure for sourcing cannabis from an authorized producer is relatively simple. Patients should first meet with a health-care practitioner to determine if cannabis can be beneficial in treating their symptoms. If so, the latter provides patients with a medical certificate required for registration with one of the 132 producers authorized by Health Canada. Then patients can buy fresh, dried cannabis, or cannabis oil. Under the regulations, no intermediaries are allowed to sell medicinal cannabis to patients. Dispensaries and ‘compassion clubs’ are illegal, even though they were more or less tolerated and present in the Canadian landscape until recent legalization. The Canadian medicinal cannabis regime was established in the context of illegal cannabis use. Now that this is no longer the case, is this regime still relevant? Before delving further into this question, let’s consider the context in which the government implemented its medical program. It allows patients to have access to medicinal cannabis without danger of being criminalized. The Canadian Medical Association (CMA) was clearly against having its members prescribe cannabis to patients. It should be noted that the CMA represents Canadian physicians, promoting, among other things, health policies, strategies, and access to quality health care. Its arguments are that there is insufficient clinical evidence about the medicinal benefits of cannabis, and that available data on indications, potency (THC, CBD levels) drug interactions and adverse effects are still too few. Furthermore, the CMA argues that the medical profession does not have to authorize the use of cannabis since it has not gone through Health Canada’s regular pharmaceutical regulatory approval process. As indicated in its August 2016 submission to the government, the Association believes that “it is important that there be support for research of marijuana in order to develop products that can be held to pharmaceutical standards, as is the case with dronabinol (Marinol®), nabilone (Cesamet®) and THC/CBD (Sativex®)”. According to Dr. Jeff Blakmer, CMA Vice President, “eight out of nine physicians in Canada do not feel comfortable discussing or providing access to medical cannabis”. Despite its obvious opposition, and in response to the implementation of the medical program, the CMA has complied with the government’s wishes. But the complete legalization of cannabis has changed the situation. Now that recreational cannabis is legal, the CMA is calling for the abolition of the medicinal cannabis program, and is actively seeking to dissociate itself from it. In preparation for the legalization of recreational cannabis, the government conducted a public consultation. The Canadian Medical Association participated once again. In its submission to Health Canada in January 2018, it recommended unyieldingly that there should be only one system and one regulation for medical and recreational cannabis. This repeated what it had already stated in its first submission regarding its disagreement with the prescription of cannabis as medicine. As Dr. Jeff Blackmer publicly stated at a major medical conference gathering scientists, physicians, pharmacists and nurses, some time before the Cannabis Act came into force, “our view is really that now that the government is obviously intending to legalize this, once this is a substance that’s available to all Canadians, there’s really no need for physicians to continue to serve in that gatekeeper role”. His statement was so clear-cut that there was an outcry and, booed by the audience, Dr. Blackmer left the room. Also present at the conference was Dr. Mark Ware. He heads the Quebec Cannabis Registry and president of the Canadian Consortium for the Investigation of Cannabinoids, the body responsible for the conference. An outstanding researcher and professor at McGill University who has devoted his career to research on cannabinoids and chronic pain, Dr. Ware recently left academia to become Executive Director at Canopy Growth, the world’s largest cannabis producer. 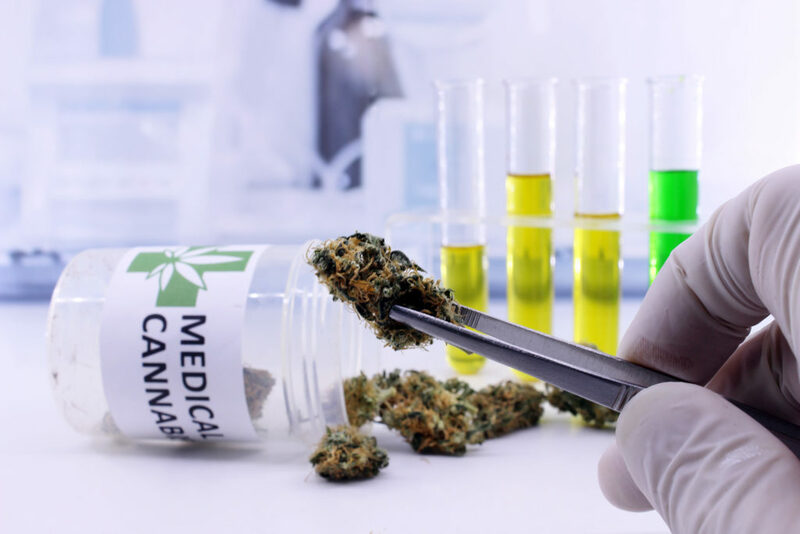 This specialist believes that it would be a mistake to abandon the medicinal cannabis program, since all cannabis products would subsequently be considered for recreational use. Without the supervision and monitoring of health professionals, patients would be left alone. Dr. Ware also believes that products made from isolated cannabinoids – therapeutic options that doctors would clearly prefer to prescribe – are not as effective as dried flowers because of the entourage effect. He acknowledges that science still has much to understand about the complex interactions of cannabinoids and terpenes contained in the cannabis plant. There is need for further research. The Canadian Nurses Association (CNA), which represents more than 139,000 nurses, also supports the continuation of the program, stating that “without the distinction between the two types of cannabis, the production of this product will be based solely on consumer demand”. CNA public policy and program manager, Karey Shuhendler, points out that even if it is the same plant, cannabis used for medicinal purposes differs greatly from cannabis used for recreational purposes, particularly in that it contains less THC and more CBD. In addition, if the medicinal program were to be dropped, patients would no longer be able to benefit from medical monitoring to assess therapeutic and adverse effects and possible drug interactions. As a result, the approximately 300,000 Canadian patients who use medicinal cannabis would be left to their own devices, a concern also shared by Dr. Ware. On the side of patients, there is the same concern. James O’Hara, a medicinal cannabis user and president of the Canadian Organization for Equitable Access to Medical Marijuana, insists that physicians remain engaged in research and want to integrate cannabis as a treatment rather than withdrawing it from the equation. He adds that medicinal patients often need varieties that have been specifically developed to treat their conditions – anxiety, nausea caused by cancer treatments, seizures – and that in the absence of a medical context, there can be no guarantee that such varieties will remain available. In addition, the organization is concerned about the stigma associated with the use of medicinal cannabis, which would only increase if the medicinal program were abandoned. This view is also shared by the Dravet Canada organization, which believes that it is “crucial for patients that cannabis is considered actual medicine“. Indeed, patients affected by the Dravet syndrome – like all other holders of a medicinal cannabis permit – benefit, in particular, from health insurance coverage and regular cannabis supply. Where Are the Canadian Medicinal Cannabis Patients in All This? The shortage of recreational cannabis across Canada only a few weeks after legalization is a source of concern that affects medicinal users. In fact, the same authorized producers supply both types of cannabis. Since October 17th, 2018, many patients have had difficulty obtaining the varieties they used to buy. These producers had promised their medicinal customers an uninterrupted supply, but it seems that the high demand for recreational cannabis and exports abroad are affecting medicinal stocks. Authorized producers are not required by law to hold stocks for medicinal demand although Health Canada expects them to prioritize medicinal sales. These companies justify shortages by citing a sudden increase in the number of medicinal patient registrations just days before recreational legalization. In addition, many patients who anticipated the shortage placed orders just before October 17th, 2018, increasing medicinal demand. The government is urging authorized producers to be transparent and to inform their patients of the length of the delays. On the Tilray site, however, patients are not finding anything very informative: “Out of stock. Coming soon”. For the time being, the government has agreed to continue the medical program for another five years. What will happen in the meantime? Complete legalization is undoubtedly a very positive milestone. But in the case of Canada, there is need for rigorous monitoring and a commitment on the part of all involved parties to guarantee cannabis access to those who need it most, those who have paved the way for the legalization of recreational cannabis: patients. The post The Future of Medicinal Cannabis in Canada appeared first on Sensi Seeds Blog.